Prepare to be meet your new music obsession, Ruel. The 15-year-old singer-songwriter from Australia is one to watch – and his latest EP, Ready, is proof. J-14 caught up with the cutie to talk all things music, crushes, and even how he got his name! And tbh, we’re swooning. J-14: Tell us about your name, it’s so unique! Ruel: It’s my real name! My full name is Ruel van Dijk. It’s Dutch, and all the eldest males of every generation are named Roeolf but you get called Roel for short. But my mom didn’t like that spelling so she changed it to Ruel. I don’t speak Dutch though – I was born in England, and I came to Australia when I was three. I’m from the northern beaches of Sydney, the best place in the world! 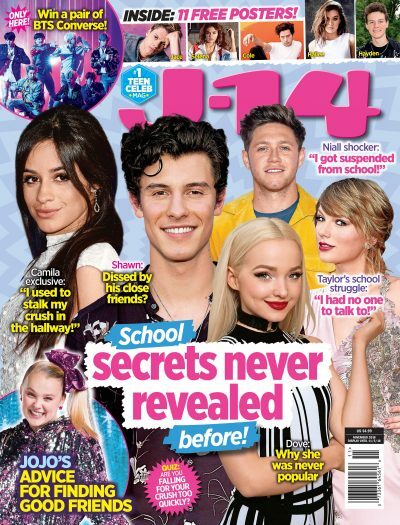 J-14: Has it been hard adjusting to fame? Ruel: To be honest, when I’m in Australia I don’t really feel famous at all. I can just go back to a normal teen life; I go to the beach, hang with my friends, go around town – it’s pretty chill. And my friends don’t really make a big deal about it either – I’m definitely not the center of attention when I go back to Australia! J-14: You opened for Khalid on his Australian tour—how amazing was that?! Ruel: I mean, he’s a legend. He’s just such a great dude and super nice. It was my biggest ever tour and I was playing to huge audiences. I was so excited because he’s also one of my favorite artists. I really learned so much about how to play arenas, how crowds work, and how to work a crowd. It was awesome. J-14: You’re a huge Tyler, The Creator fan and he handpicked you for his Camp Flog Gnaw festival in L.A. on November 10-11—are you totally geeked? Ruel: I can’t even believe it. He’s probably my favorite artist of all time. J-14: Who is your dream collaboration? Ruel: Frank Ocean, I just think he’s one of the greatest and he’s definitely going to be a legend. Every song he releases just blows me away. J-14: Who is your biggest celeb crush? Ruel: Jorja Smith! She’s an amazing R&B singer, she’s just so cool. J-14: Have you learned a lot about girls by having so many female fans? Ruel: Well, I have two older sisters I guess they always told me what a female is and needs! So they’re pretty helpful. J-14: How do American girls compare to Australian girls? Ruel: American girls are really aggressive – they get their eye on something and they go after it. Australian girls are pretty shy. J-14: What do you wish that girls knew about guys? Ruel: Just that we’re normal people! I feel like everyone is so scared to talk to each other. So growing up, I went to an all-boys school, so that was weird. And then I went to a coed school and everyone was like “Oh my gosh how are you doing to deal with having girls around? !” And it’s like, we’re all just normal people! They’re not like totally weird creatures. J-14: So from a guy’s point of view, what’s an easy way to start a conversation with a boy? Ruel: Don’t overthink it, just talk to them like they’re someone you already know. Just be confident. That’s what I think guys like the best: a girl who’s confident. Don’t try to play it cool or play games. Obviously don’t be too aggressive, but just treat a guy like a normal person.